Ilona is the Tucson Symphony Orchestra’s Assistant Principal Viola, string quartet violist and the Young Composer’s Project instructor. She has a Bachelor of Violin Performance from Manhattan School of Music and a Masters of Musical Arts in Viola and Composition from Yale University. She studied the violin with Rafael Bronstein, viola with Walter Trampler and composition with James Drew. She was a Fulbright Scholar and performed a debut recital in London that included a premier of her viola sonata “Mladost”. Ilona’s compositions include a series of musical dramatizations of Susan Lowell’s children’s books such as the “Three Little Javelinas”. These compositions feature the TSO string quartet performing as soloists with the orchestra. Every year one of these musical stories is performed on the TSO’s week long KinderKonzert series. Previously she had been on the New College Faculty, Sarasota Florida, teaching music theory and composition. 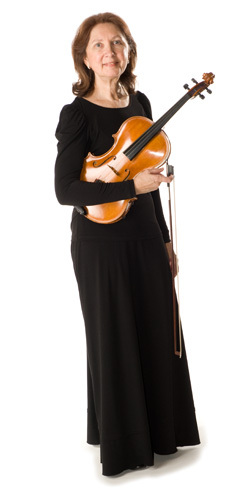 She is currently the Program Director of the Junior Artist Seminar and the Junior Music Camp at Rocky Ridge Summer Music Camp where she is also the composition instructor and violist in the Southwest String Quartet. How long have you played the viola? Guilty musical secret: I played on a Stradivarius viola at a chamber music party in Geneva, Switzerland, and I didn’t like the instrument! Funny musical experience: I played the Bartok Viola Concerto for a competition and the judges thought I was a violinist and awarded me a prize in the violin division! What would your career be if you hadn’t chosen to be a musician? I always knew I would be a musician. I love playing music! (I was also interested in mathematics or law). Hobbies: Growing African violets, knitting and photography. Interesting personal facts: I love to dance! Favorite pets: I have two Siamese cats, Huckle and Lavender.